The Swiss design duo Fulguro doesn’t want you to waste a drop of precious rainwater for your plants, your yard, or your home. Their easy-to-use reLEAF rain collector consists of a folded thermo lacquered aluminum sheet that mimics the design of plant leaves but aids in the collection of extra rainwater that might otherwise trickle away. 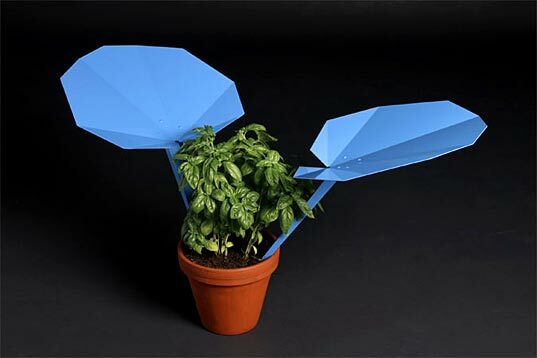 reLEAF can be inserted into flower pots or watering cans as a means to direct water or provide relief in the absorption of additional moisture that nurtures potted plants. Fulguro studio is the collaboration between Cédric Decroux and Yves Fidalgo, Lausanne-based designers who teamed up in 2002 to work on product design, interior architecture, and graphic design projects. Their recent focus has been on designs and devices that highlight the connections that we need to foster between water and plant life in modern dwellings. Fulguro is currently exhibiting reLEAF in the ‘Belle Vue exhibition of Young Swiss Designers’ at Vienna Design Week(s). Whether reLEAF’s design seems essential or not, we like the attention that it draws to water as a valuable resource in the cycle of conservation-minded household management. The sculptural reLEAF insert measures approximately 50cm x 40cm x 30 cm, and for now, comes in blue alone. I love this idea...I leave my watering cans out in the rain, but they never collect much. I say keep it metal and make it different sizes and thicknesses so that when the rain drops hit it, it makes various musical notes....as a matter of fact you could make a whote set tuned to a specific scale. The effect could be really nice...and you'd be collecting rain water! This would be ideal in an amergency kit. 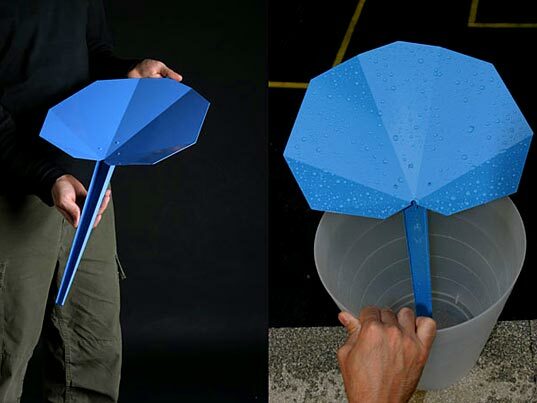 You would be able to harvest rainwater. I agree that in a plant pot it is overkill and would likley drown the plant in question. Obviously it doesn't suit some climates and some plants but in general it mimics the inward facing leaves of some real "water conscious" plants - but why is it made using high energy aluminium - is this not contrary to energy saving. Why not use potato (see spudware article) or waterproof paper leaves instead? May not last as long but at least the length of ones vacation. But...but...but.... here's a device (actually a clever marketing construct aimed at the trendy greenies) that is totally not necessary. If a plant is outside it will get the water it needs - funneling it will more likely overwater the poor thing. If the plant is inside use a watering can. I love it when "designers" create tools wasting resources. Very clever, it's something I've always wanted to find but didn't realise they existed!